In late 2006, beekeepers have noticed that the hives they were maintaining slowly were disappearing. Bees were not returning to the hive. Usually, a colony of bees die out because a queen bee is no longer present. In this case, the queen bee is still there and the capped brood (bee eggs and larvae) are still unhatched, which bees never leave until. They had no explainable reason for this phenomenon. They called it Colony Collapse Disorder (CCD). It was first applied after the huge rise in the number of dispearances of honey bee colonies in North America in 2006. CCD is a significant problem since many agricultural crops rely on bees for pollination. Pollination is the process by which pollen is transferred in plants and crops for fertilisation and sexual reproduction. It is an important process in the cultivation and growth of agricultural crops. The American Institute of Biological Sciences reports that bees and other insect pollination saves the United States agricultural economy nearly an estimated $3.1 billion annually through natural crop production. In addition pollination produces some $40 billion worth of products annually in the United States alone. Colony Collapse Disorder if gone unchecked will have both the economic and ecological implications the world over. Presently, CCD has been observed in Belgium, France, the Netherlands, Greece, Italy, Portugal, and Spain, It has also been recorded in Switzerland and Germany in a lesser extent. Reports also state that Taiwan may also be affected with CCD. Researchers at the San Francisco State University have discovered a clue to CCD. 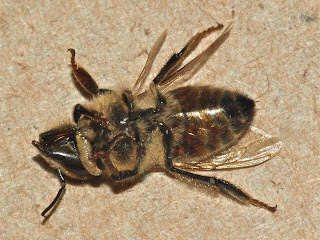 They found that honey bees may be hosts of a fly parasite that causes them to abandon their hives and die after a bout of disoriented, "zombie-like" behavior. Infected bees abandon the hives, disoriented in a zombie like behavior and then dying. This discovery may give scientists additional insights about colony collapse disorder. Although the fly parasite has only been found in honey bee hives in California and South Dakota, professional bee companies transport their bees throughout the whole United States and may have exposed the bees to the parasite during travel. John Hafernik, President of the California Academy of Sciences and SF State Professor of Biology, says that the possibility that it is an emerging parasite "underlines the danger that could threaten honey bee colonies throughout North America, especially given the number of states that commercial hives cross and are deployed in,"
It was Hafernick who discovered the parasite after leaving bees overnight in a vial and discovering fly pupae surrounding them the day after. The fly, Apocephalus borealis, deposits its eggs into a bee's abdomen. Usually about seven days after the bee dies, fly larvae push their way into the world from between the bee's head and thorax. But it's the middle part of this macabre story that may be the most scientifically interesting to those studying the dramatic and mysterious disappearance of honey bees. After being parasitized by the fly, the bees abandon their hives in what is literally a flight of the living dead to congregate near lights. "When we observed the bees for some time—the ones that were alive—we found that they walked around in circles, often with no sense of direction," said Andrew Core, an SF State graduate student from Hafernik's lab who is the lead author on the study. Core won first place at the 2011 California State University Research Competition and the Geraldine K. Lindsay Award for excellence in the natural sciences at the annual meeting of the Pacific Division of the American Association for the Advancement of Science for his presentation of the bee research. Bees usually just sit in one place, sometimes curling up before they die, said Core. But the parasitized bees were still alive, unable to stand up on their legs. "They kept stretching them out and then falling over," he said. "It really painted a picture of something like a zombie." Some researchers have pointed to the virus and fungus as potential culprits in colony collapse disorder, and hive abandonment is the primary characteristic of the disorder. It may be time, Hafernik said, to consider how the fly parasite fits into the CCD picture. He said the next step is to find out exactly how the parasite is affecting the bees' behavior. It is possible, he said, that the parasite is somehow interfering with the bees' "clock genes" that help them keep a normal day-night rhythm. The researchers also don't know if the infected bees are leaving the hive of their own accord, or whether they give off some sort of chemical signal that provokes their hive mates into throwing them out. 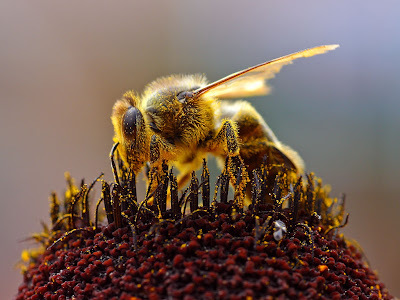 "A lot of touching and tasting goes on in a hive," Hafernik said, "and it's certainly possible that their co-workers are finding them and can tell that there's something wrong with them." The scientists will deploy a range of tools -- from tiny radio tags to video monitoring -- to help them answer these questions and discover ways to protect the hives. "We don't know the best way to stop parasitization, because one of the big things we're missing is where the flies are parasitizing the bees," Hafernik noted. "We assume it's while the bees are out foraging, because we don't see the flies hanging around the bee hives. But it's still a bit of a black hole in terms of where it's actually happening." Genetic analysis of the parasites confirmed that they are the same flies that have been infecting bumblebees, raising the possibility that the fly is an emerging and potentially costly new threat to honey bees. "Honey bees are among the best-studied insects in the world," Hafernik noted. "So at one level, we would expect that if this has been a long-term parasite of honey bees, we would have noticed." From 4.5 million hives in the US in 1980, The National Agriculture Statistics Service reports that 2008 figures show only 2.44 million. The US at the moment imports bees from Australia. A practice not utilized since the 1920s.